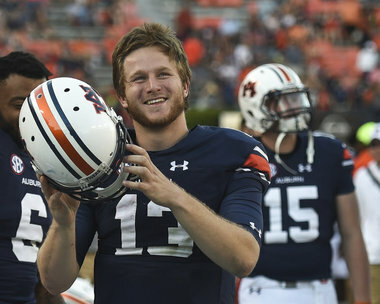 Shirts With Random Triangles: Auburn backup QB Sean White dismissed following public intoxication arrest. According to al.com, White was arrested by the Auburn police Sunday morning around 5:45 AM. "The arrest report lists 141 N Ross St., the address of Auburn's police department, as the location of the arrest. The report notes White's condition as drunk and that the arrest was "on view" as opposed to in response to a call or for a warrant. White was admitted into Lee County jail at 3:28 a.m., where he was held on $500 bond, according to jail records. Lee county sheriff Jay Jones said White was released Sunday morning on his own recognizance." White had previously served a two-game suspension for undisclosed reasons.